S0738. HENRYK SZERYNG, w.Ristenpart Cond. Saar Chamber Orch. : Violin Concerto #3 in G, K.216 (Mozart), Live Performance, 11 Sept., 1959, Saarlouis, Germany [a breathtaking performance! ]; w.Martinon Cond. RTF S.O. : Violin Concerto in E - Live Performance, 26 March, 1963, Salle Pleyel, Paris; HENRYK SZERYNG & GÉRARD POULET, w.Dimitri Chorafas Cond. RTF S.O. : Concerto for Two Violins in d - Live Performance, 7 Sept., 1963, Besançon, France (both Bach). 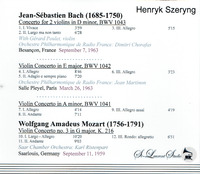 [Among the most highly treasured recital disks we are privileged to offer, in excellent sound quality!] (Canada) St Laurent Studio YSL T-791. Transfers by Yves St Laurent. “Gérard Poulet was born in Bayonne in 1938, the son of conductor Gaston Poulet, entered the Conservatoire de Paris in André Asselin's class at age 11 and was unanimously awarded first prize in violin at age 12. He performed Salle Gaveau the same year under the direction of his father with the Concerts Colonne. 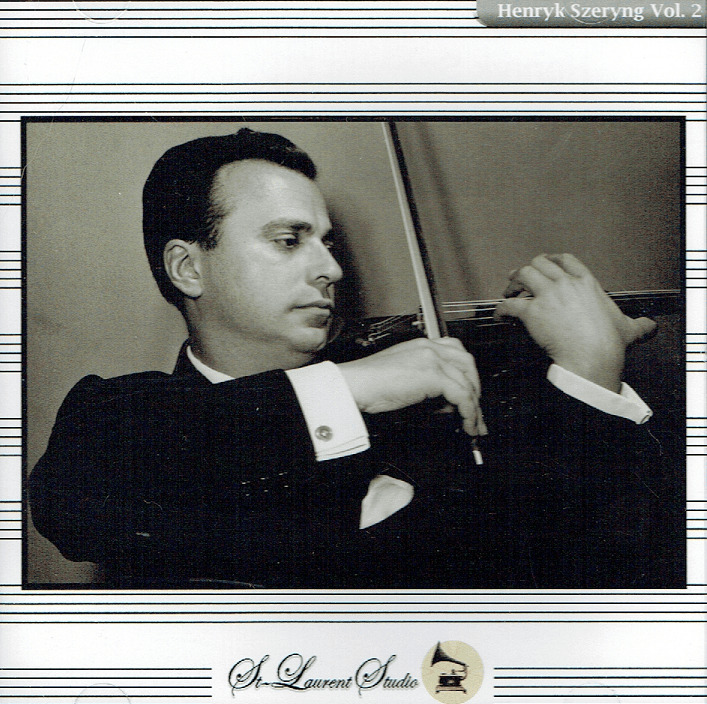 In 1956, he won the 1st Grand Prix of the Paganini Competition in Genoa then perfected his skills with Zino Francescatti, Yehudi Menuhin, Nathan Milstein, and Henryk Szeryng. He considers the latter as ‘his father in music’. Poulet was professor, then honorary professor at the Conservatoire de Paris. He was also a full professor at the École Normale de Musique de Paris and at the Tokyo University of the Arts.